Yup, that’s me, the ugly fat boy, but I made it through again. 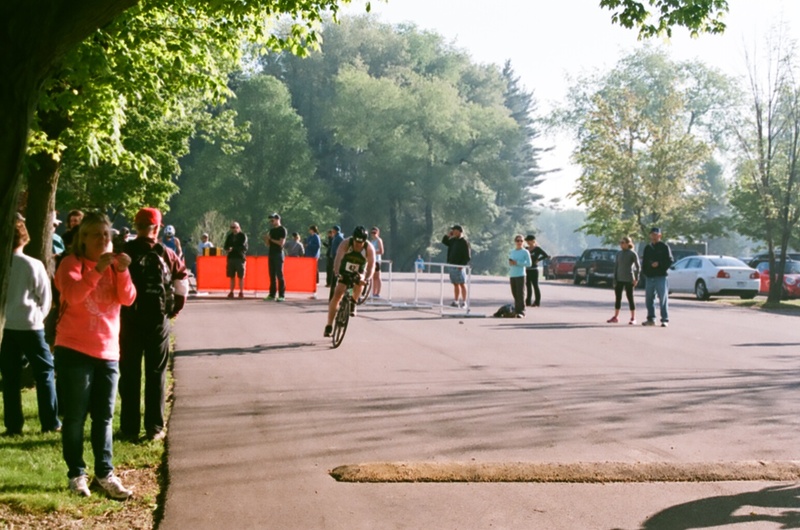 This was my 53rd triathlon, Clay’s Park in North Lawrence, Oh. They put on a good race, I did OK. Feel free to check this link definitely nothing to be impressed with. Up at 4:30, we had to stay in a hotel because it was about 2 hours from where my son and daughter live and that would have meant leaving at about 4 in the morning to be there in time. This way we were only about 45 minutes and didn’t have to get up until 4:30 to make sure I was all set to start by 7:45, Yippee. Now I’ve heard other people do this staying at a hotel, they set their phone, their watch, the radio and have the desk call. Didn’t matter, I was awake, but I did hear all things go off, which doesn’t often happen, all usually fail to go off. My son and grandson were with me, usually I go alone, no one else wants to have to get up this early on a Saturday or Sunday morning. It was really great to have them with me, especially at the beginning, so much to get organized, having someone just hold your bike while you register, PRICELESS. We (we being just me) squeeze into the wetsuit, which as you can see is a challenge. This was a small race and for whatever reason the old guys were put up in the second wave. There were only four waves, but still, the waiting around to start is not fun. There is the kibbutzing, not really trash talking, if anything, in triathlon, it’s the other way around. “Oh, my swim stinks, I’m never going to get through it.” Yeah, right this is the guy who strokes right by you. Just trying to get you to let down your guard, kinda of take your edge off. The temperature at the start was around 49 degrees, but the sun was bright, so it didn’t really feel cold, but it is strange when you’re standing in water and you can see your breath, and others. The horn finally goes off, you run until you have to swim, you start swimming way faster then you should, you get your breathing up, your heart beat up and then wonder why you’re flapping around like a lame duck. You have to keep looking up, especially in this race, everyone seemed to be getting pushed to the left of the buoys. I only got shoved around a couple of times and kind of smacked from the side, so pretty tame start. So you finally get through, for me took about 11 minutes to go 500 yards, not at all anything resembling wonderful, but it will do. Look down at the GPS watch, find it’s not doing what it’s supposed to??? It is keeping splits, so you just hit the split for the transition. My swim to bike transition is always abysmal and it was again today, being too fussy, need to just throw on shoes, helmet, glasses and go. But I have to putz around. Finally get going and am doing pretty well. One thing about the hills around where I live, is that it’s great training. There were hills in this race, but nothing that couldn’t be handled, and eleven miles later, decent bike split. Throw off my shoes, my helmet, throw on running shoes and I’m out the gate. The run too, was pretty uneventful, and it should be because everyone else has finished. All right, not everyone, but there was sure no crowd left. The run was pretty flat and I maintained a decent pace and finished. My son was taking pictures, which is nice, it’s a really small race, so there wasn’t anyone taking pictures for money and you like to have something to remember, other than a t-shirt, because I sure wasn’t going home with any awards, I don’t know, maybe fastest pastor, being the only one I knew of. It was a nice overall day, I got to spend time with my kids, we literally drove right by the Football Hall of Fame, so we had to check that out. The William McKinley presidential museum It was fun, quick stop at McDonalds, two hours back to pick up my wife and our luggage and then a three mile drive from there. Reality smacked me right in the face, when we were about twenty minutes from home, got a call that the mother of one of the church’s elders was dying, stopped to pick up the police chaplain van as the police chaplain because I’m on call until Tuesday, got home, put on more appropriate clothes, rushed to the hospital and spent a couple of hours there. Next morning woke up early, conducted Matins worship at 8:30, Bible study, worship at 10:30, prayer meeting at 1:30 and then finally home and flopped. Great weekend, it started on Wednesday when we attended my son’s graduation, very proud of the Timothy and great quality time with our daughter Erica, and grandson Nicholas. This entry was posted in Sports, Uncategorized and tagged 53rd, challenge, family, triathlon on May 27, 2014 by Pastor Jim Driskell, Lutheran Church. Congratulations, anytime you complete a triathlon it is quite an accomplishment!